The team and I came into the finish line of this race and I said 'wait a minute, we're done???'. This was a great race among many friends, and was such a fun celebration. Every year I've run this race, it's a little bit different and I learn a little bit more about the dogs. 6th place out of 12 teams. Read the write up of this race here. 12 dogs, 240 miles, February 17-19 . I chose to travel to the UP200 for another year based on the memories of glistening golden sunrises and frigid winter winds. The 2017 UP200 still delivered on the sunrises, but the temps were warm and mushy. However, this race was one of our best-run races yet, coming into the finish with a full team of dogs that looked like they just started. I was so proud of the team in this race. Many thanks to Ed and Tasha Stielstra of Nature's Kennel for helping host us before the race, for helping find the handler team of Jon and A.J., and for the hilarious and supportive Lynne Witte for EVERYTHING. 9th place out of 14 teams, as well as the Sportsmanship Award. Read the write up of this race here. This was the fourth time in the race, and while each race is different, this one was particularly hard because of a unique set of challenges, as well as a complete re-drafting of the race format, race route, and race rules. This was the hardest Can Am yet, but also the most straightforward in some ways. 9th place out of 14 teams. Read the write up of this race here. At the finish of the UP200, 11 dogs strong. Hyside and House in lead. Wembley all eyes on the finish. Sigurd Utych photo. 12 dogs, 100 Miles, January 23rd. This race was incredibly exciting because it not only happened in our backyard, we helped organize this first-time race event. 4th place out of 17 teams. Read the write-up of this race here. 12 dogs, 240 miles, February 12. Not long after the Mahoosuc 100, we pointed our noses to Michigan for the UP 200! This was a wonderful new adventure, and we only got there with the help from many hands. 8th place out of 14 teams. Read the write-up of this race here. 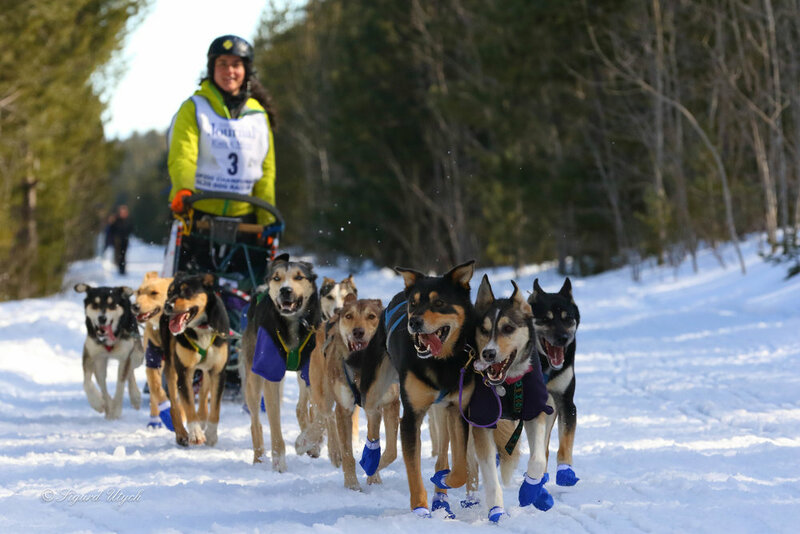 12 dogs, 250 miles, March 5. This was our the third time in the 250. The Can Am was my first real race, and it occupies a special place in my heart. 6th place out of 15 teams. Read the write-up of this race here. 12 dog race, 100 miles with 4 hour layover. Team: Bayley, Wembley, Grenade, Nibbler, Tawhio, Maihi, Taz, Thai, Luqa, Gunnar, House, Chase. Team: Bayley, Wembley, Maihi, Gunnar, Nibbler, Ellie, Taz, Thai, Luqa, Chase, House. 12 dog 250 mile race, four checkpoints. Team: Bayley, Wembley, Maihi, Gunnar, Nibbler, Taz, Thai, Luqa, Chase, House, Tawhio. Great Northwoods Sleddog Challenge Sprint Class: 2nd place. 8 dog stage-style race with three legs and a 10 dog pool. Stage 2 of the Great Northwods Sleddog Challenge. Grenade and Wembley in lead. Can Am 30: 9th place.